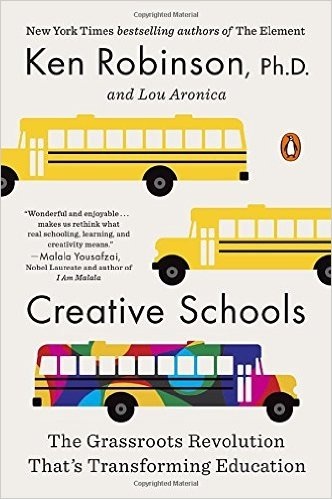 Creative Schools: The Grassroots Revolution That’s Transforming Education by Sir Ken Robinson and Lou Aronica ©2015 offers advice for educators and policy makers that can bring rigorous, personalized, and engaged education to everyone. As a leading voice in education, it’s vital that anyone interested hear what Sir Ken has to say. If you haven’t seen his number one TED Talk check that out too. Click at the bottom on any page to purchase this necessary book. Sir Ken is an English author, speaker, and international advisor on education in the arts to governments, non-profits, education, and arts bodies. He was Director of The Arts in Schools Project (1985–89), Professor of Arts Education at the University of Warwick (1989–2001), and was knighted in 2003 for services to education. He is the author of The Element, Finding Your Element, and Out of Ours Minds. His 2006 TED Talk How Schools Kill Creativity is the most watched in history with over 33 million views. Originally from a working-class Liverpool family, Robinson now lives in Los Angeles with his wife Marie-Therese and children James and Kate. Lou Aronica is the author of three novels and the coauthor of several works of nonfiction, including the national best sellers The Culture Code, The Element, and Finding Your Element. The current reforms are being driven by political and commercial interests that misunderstand how real people learn, and how great schools work. As a result they are damaging the prospects of countless young people. The standards culture is harming students. In response, Sir Ken continues to push for a more balanced, individualized, and creative approach to education. Instead, schools take children with voracious appetites for learning and see to it that their appetites are dulled as they go through school. Current efforts focused on raising standards through competition and accountability do not work, and compound the problems they claim to solve. If you design a system based on standardization and conformity, you suppress individuality, imagination, and creativity. Schools that were designed to produce factory workers resemble factories with their assembly line approach. Current reforms stick with this approach only to be less in tune with the circumstances of the 21st century. Sir Ken thinks that schools need to be transformed not reformed, and that we know how to do it even though we aren’t. This entry was posted on Wednesday, June 3rd, 2015 at 7:34 am	and is filed under Book Summaries, Education Books, Leadership Books. You can follow any responses to this entry through the RSS 2.0 feed. You can leave a response, or trackback from your own site.